While all countries differ in political climates and cultures, the United States can be lumped into a category with other countries that we can generalize as “civilized.” Countries such as Canada, France, Germany, Australia, Ireland and others would all fit into this category as we have similar ethics and cultures in a broad sense of the word. Since domestic infant adoption has been seen as something that is necessary to “save” babies from a life of poverty and no opportunities, thousands of babies, each year, in the United States, are relinquished to adoption from perfectly capable mothers. I was wondering why the babies in this country needed to be “saved” and decided to take a look at other countries, like ours, to see if the same theories and ethics applied, in regards to domestic infant adoption. Certainly, because we are all human beings, the same situations of what we consider a “crisis pregnancy” would exist in other countries. How do other countries handle crisis pregnancies? In America, the solution seems to be adoption, at all times. That is what is encouraged. That is what is socially acceptable as the “selfless and right” thing to do. First let’s take a look at the number of adoption by country with an image that was borrowed from the United Nations. As you will see, the number of adoptions in America is WILDLY disproportionate to those in other countries of similar cultural values. The adoption industry, in America, has jumped through enormous hoops over the past several decades to assure that infants become easier to obtain. The focus has been on a cultural acceptance of separating mother and child as the “best” thing to do as well as lobbying Congress with hefty funds that are generated, and then in turn donated, from the adoptions of these children. Do not be fooled; Adoption, even the “non-profit” kind, is a BIG money-maker. The profits are given to other “non-profit” firms (tax-free I might add) who then use those “donations” to lobby for law changes that will assure the easiest road possible to keep the industry running. And as long as there are people who are “in want” of those babies, this is how it will always be. Why is it that a mom can sign away her rights hours after birth in this country? Why the rush? Because it lessens the time period she has to change her mind. Why do most states allow for no revocation period? Because it makes it impossible for her to change her mind. These are not laws that protect mothers and their children. They protect the agency and the agency’s clients – the hopeful adoptive parents. The cycle just keeps going while the adoption machine gets bigger. You get the idea. This goes on and on and on for just about every European country. As a matter of fact, international adoption is THE most common form in Europe. Between 70% and 90% of all adoptions come from other countries, not domestically. Consent cannot be given for months and/or can be revoked for months. Let me remind you of that chart from the beginning of this article. The United States allows parents to sign their rights away HOURS after birth and sometimes before. See, I believe that when consent is signed is the key. I believe that a mother cannot fully understand the decision she is about to make without first taking the time to attempt to parent her child. There will be some who may say, “Well, that may be so. But I’d rather see a child given up for adoption than to live in a home where it will be abused, neglected or unwanted.” Let’s address this, shall we? The rate of child abuse fatalities in the United States is three times the rate of Germany’s, more than twice the rate of the UK or Japan, and almost twice the rate of France. (6) We can just throw that argument right out the window. Besides, what do you expect from a country who treats children as commodities? Your last paragraph does NOT negate the argument of the previous paragraph! To me, it seems like it actually supports the previous paragraph. Why wouldn’t you want a child placed in a loving adoptive home instead of being murdered by the biological family. You don’t clarify who is abusing the children and whether the children are adopted or not. Your article doesn’t even begin to examine if the child is better off in the adoptive home or not. As an adoptive parent and a friend of many other adoptive parents, both domestically and internationally, I have seen the love and care given to our adopted children. I honestly don’t even think of my daughter as adopted, she is my child. On the other hand I have seen many children abused and/or neglected by biological families. In one case I know of personally, the biological mother kicked her 5 children (5 – 13 years old) out of the house with nowhere to go at 2:00 AM because her current boyfriend didn’t want them around. And that wasn’t the first time she had done something like that. It shouldn’t surprise anyone that adoptions in those countries are down now that their governments have placed huge barriers to the adoption process. What are the costs for getting an adoption in those countries now that you have to get the government’s and/or court’s approval? How long does it take? How much governmental red tape and hoops do you have to jump through? What is the likelihood that the government/court will approve the adoption? 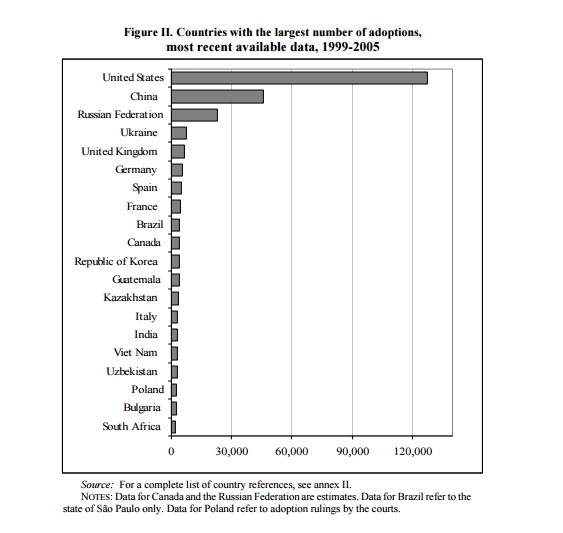 The chart isn’t clear on whether that is the number of children in that country given up for adoption or is it the number of adoptions that took place whether the child was domestically or internationally placed? The chart’s title suggests the latter which would require subtracting the number of children adopted from other nations for the true number of children given up for adoption in that country. It also doesn’t take into the consideration the populations of those countries. In countries with large populations it only makes sense that they have more adoptions. A more accurate comparison would be the percentage of children given up for adoption compared to the number of live births per country. The real issue isn’t about trying to fix the American adoption system, it is about fixing America’s Me First culture and providing safe and nurturing homes for our children. Adoption has not solved child abuse. In a country that has horribly higher rates of adoption our child abuse rates are still higher. You are part of the problem. The stigma of the mother who would abuse or kill her child if it was not adopted. No one should be terminating parental rights days after a baby is born. Did this article strike a chord with you? All I hear is ME ME ME ME. Make it easier for ME to adopt. Having a lot of money does not mean a good life. And adoptive parents abuse children just as often as natural parents. If you are an adoptive parent I seriously hope you take the time to educate yourself. Read adoptee blogs. You are seriously misguided, self-centered and have a hero complex. Adoption…… Is in my eyes something that us Americans wear as a hand bag. The article stated that other countries let the mother have two months to decide, except Spain. Ma’am I think if the mother of “your” child had two months to decide you would probably not be wearing the label adoptive mom. I would also like to point out why we needed to know original moms dirty secrets. Did you see such incident with your own eyes? Now back to the facts, in the great Usa. We have record highs of child abuse, neglect is very common with Adopted Children. I went to a boarding academy and 56% adopted. The parents expected a different kind of kid. I’m not implying this is you but there are two sides. I do have a question. What guilt do you carry about the mistakes you made as a mother? We all have them. There was no abuse that took my son from my home. I was convinced by an agency that if I kept him I would ruin his life by simply being young and unmarried. Your assumption that children are all adopted because of abuse is ignorant to say the least. My fathers brother and sister were adopted out, not because his mother was abusive, but because she was divorced and was in a severe car accident and in a body cast. There were family found to take the three older children. But the baby and the toddler were given up by social services. How is that abusive on behalf of my grandmother? You are an ignorant man. Your child has two other parents whom you have no respect for. Do you not see that tells your child you have no respect for her? That is her dna, her biology. It MATTERS!!! Ummmm, they did not make it harder to adopt in these countries they made it easier for women to parent by providing the necessary support systems which is why these countries have far better outcomes for children than the U.S. does.